The four years ahead promise dramatic developments for Brazil's political environment, with economic and political turbulence that will probably make it a difficult period for Dilma Rousseff. Two problems and four names emerge from the results of the seventh presidential election in Brazil since the return to democracy in 1988. On Sunday 26 October, more than 110 million Brazilians went to vote after an eventful campaign. The drama continued into the count, which was open almost until the last ballots were inspected. 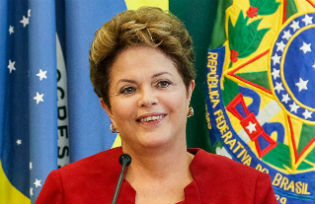 In the end the incumbent president, Dilma Rousseff, was awarded victory and another four-year term against the PSDB candidate, Aécio Neves. Dilma received 54,501,118 votes (51.64%), and Aécio Neves 51,041,155 (48.36%). Brazil now faces challenging economic and political problems. In the economic field, the country is experiencing low growth and rising inflation. The IMF’s World Economic Outlook (October 2014), for example, expects a GDP growth of just 0.3% in 2014 (a reduction from 1.3% in the previous report), and only 1.4% in 2015. On inflation, the IMF expects a rate of 6.3% in 2014 and 5.9% in 2015 (compared to 5.9% and 5.5% in the last report). How Dilma Roussef’s “developmentalist” political character will deal with these signs is a question-mark over the next four years. In the political field, things will also not be easy for the president. She will probably have to grapple with the current corruption scandal at the state-controlled oil company Petrobrás for most of her second term. This promises to be another mensalão – the series of illegal payments to senior politicians and advisors, many of them close to then-president Lula, which overshadowed his second term. A repeat would have terrible consequences for the dynamics of the Brazilian political agenda. In addition, a very fragmented and conservative Congress was elected, with for example eighty evangelicals’ representatives in the Chamber of Deputies, and three powerful PSDB politicians – José Serra, Aécio Neves and Tasso Jereissati – back in the Senate. Since this will be Dilma Rousseff’s last period in office, the election is an opportunity to see the possible shape of Brazil’s political landscape in the path to 2018. Here the name of the former president, Luis Inácio Lula da Silva, stands out as one to be remebered from the campaign. The popular Workers’ Party (PT) leader has shown that he still has a big reserve of political capital, especially in the northeast, where he was decisive in ensuring Dilma’s victory. Lula has run five times for president (1989, 1994, 1998, 2002 and 2006), then worked hard in 2010 and 2014 for Dilma Rousseff. Will he seek a “last hurrah”? He will be 74 years old in 2018 and there are some doubts about the condition of his health, factors which may stand against him running in another election. Besides Lula, another PT name emerged shining from this election: Fernando Pimentel, the elected governor of Minas Gerais. There, in Aécio Neves’s own state, Pimentel won in the first round, becoming an important asset for Dilma in the next four years. In this sense, Minas Gerais may be a clear target for high federal investments in the 2014-18 period. Aécio Neves himself is of course also a name to be remembered from this election. With more than 50 million votes, Neves became the best performing PSDB candidate since another former president, Fernando Henrique Cardoso. He may want to place himself as the opposition leader in Brazil’s Senate and try to maintain some visibility until the next election. Aécio’s rival for the party nomination next time will be Geraldo Alckmin, the governor of São Paulo. After being re-elected in the first round of the latest election, consolidating a PSDB rule over the biggest state in the country now lasting twenty-four years. Alckmin also showed strength in backing Aécio’s performance in São Paulo, where the candidate had more than 15 million votes against Dilma’s 8.5 million. In Alckmin’s favour is the fact that Aécio’s candidate for governor of Minas Gerais lost to Fernando Pimentel in the first round. The PSDB candidate also lost to the president in his own state, where he had been governor for eight years; Dilma had 5.9 million votes in Minas Gerais, against 5.4 million for Aécio Neves. Hence, the four years ahead promise dramatic developments for Brazil’s political environment, with economic and political turbulence that will probably make it a difficult period for Dilma Rousseff. These four names – Lula and Fernando Pimentel on the PT side, Aécio Neves and Geraldo Alckmin on the PSDB one – call the attention now as important actors within the emerging political dynamics. They all also seem to represent more a continuity of the “long social-democratic moment” started in 1994 and constituted by the PT-PSDB contest, than a fundamental break with it.